The first episode of Game of Thrones, Season 8 premiered today and the excitement on the Interweb was (understandably) uncontrollable. The Stark Reunion We’ve Been Waiting For! The episode, as expected, presented the reunion of the Stark kids — all grown-up and wise now — at their home in Winterfell. 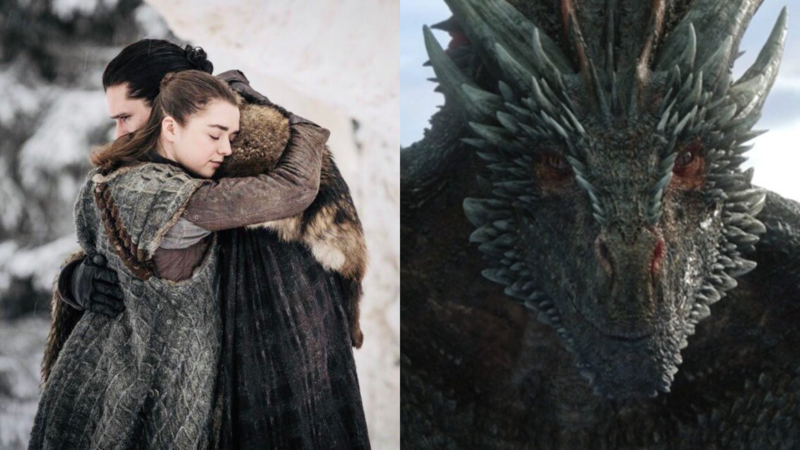 A particularly touching moment was Arya and Jon’s meeting in the forest. Moving on from the reunion, one of the most exciting scenes of the episode was when Jon Snow rode the dragon. “I don’t know how to ride dragon,” said Jon and tweeple couldn’t help but think, “It’s in your blood,” in a crossover between Harry Potter and GoT. Tsk tsk tsk, when Cersei asks for elephants, she gets elephants! Except the Golden Company didn’t have any, to her and netizens’ disappointment. As a Twitter user rightly pointed out, the first episode of GoT’s final season should be called the ‘episode of awkward encounters’. The scene that takes the cake is the brief awkward encounter between Bran and Jaime Lannister towards the end of the episode. Bran also dropped some of the most cryptic lines in the episode such as, “I am not his [Jon’s] brother,” coupled with his very serious, deadpan look. Is Everyone in This Episode? The episode, with many reunions and revelations, was slightly crowded with characters but tweeple couldn’t help missing some! What did you think of the first episode of Game of Thrones’ Season 8? Tell us in the comments below!